The Remington V3 “Turkey Pro” model was announced at the NASGW 2018 Expo in October along with the V3 TAC-13. I'll cover the TAC-13 and the V3 Compact models in separate articles: both are shipping now. Remington's dedicated turkey shotgun line-up is a big one. 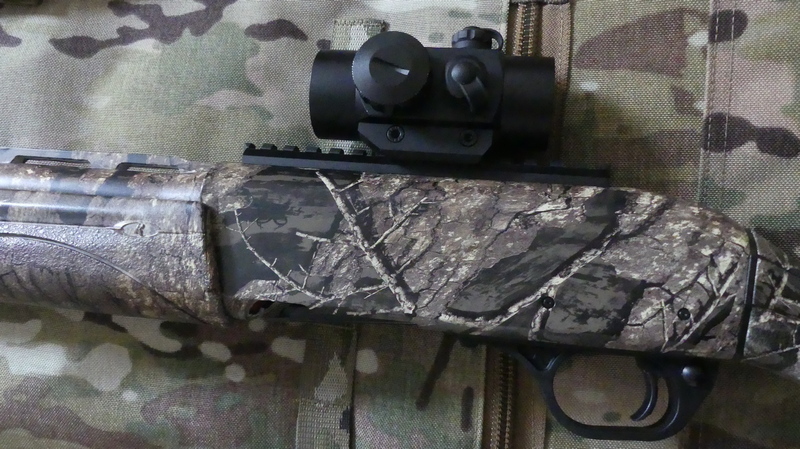 Already, there is the rifle-sighted Versa Max Sportsman Turkey Camo model, with a 22 inch barrel, and a 3-1/2 inch chamber. 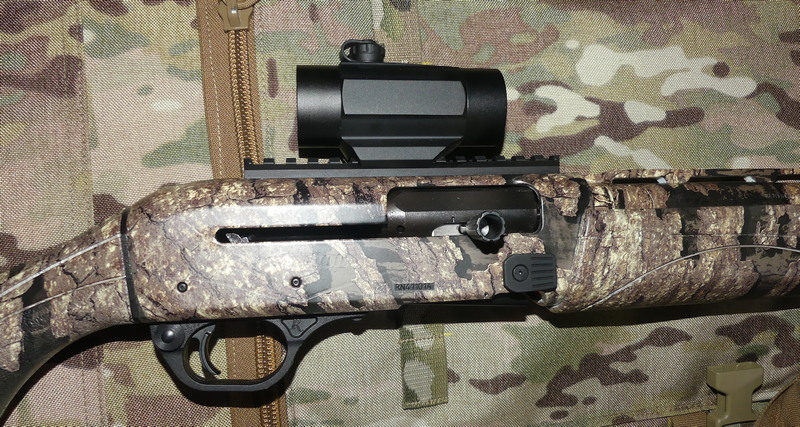 In the pump-gun line, there is an 870 Express Turkey camo with a 21 inch barrel, the 870 Express Super Magnum Turkey/Waterfowl, and the 870 Express Shurshot Synthetic Turkey, the 870 SPS Super Mag Turkey / Predator with scope ( TRUGLO 30mm Red/Green Dot Scope (Model TG8030DB) pre-mounted). Finally, there is the 870 DM Predator with an 18-1/2 inch barrel, thumbhole stock, detachable magazines, a pair of Trulock Specialty chokes, and XS Ghost Ring sights. Remington offers a lot of ways to kill a turkey. With this V3 Turkey Pro, my understanding is that they are in production and will be shipping in quantity around the first of the year. 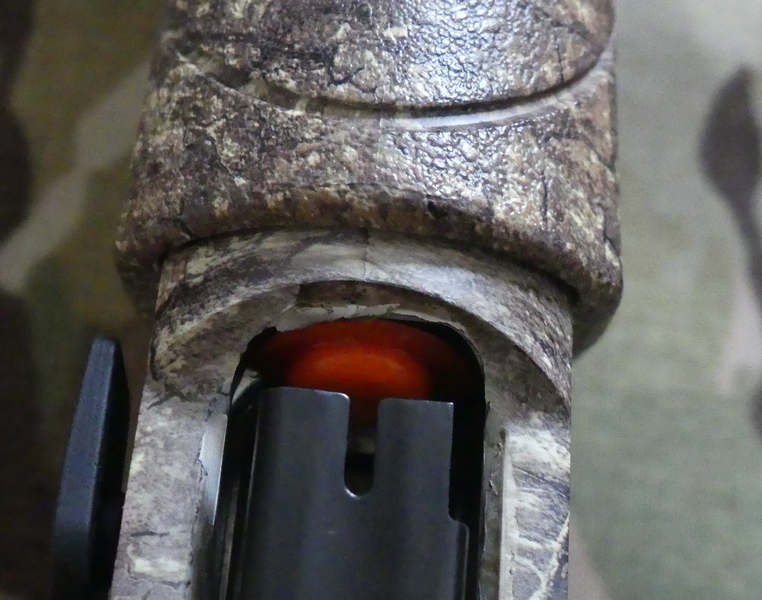 My example may not be exactly what is available, for what I have comes with one extended TruGlo turkey choke and there is no owners manual or press release as of yet for me to refer to. There are several changes apparent in the V3 Turkey Pro. The receiver has a beveled loading port, the bolt release is oversized and works extremely well, and the charging handle is oversized as well. The safety has been changed as well, now a beveled button with circular ridges apparently for a bit better feel. The Turkey Pro has a 22 inch barrel, a green fiber optic front sight, a Picatinny rail is pre-installed with a TruGlo Red Dot 1x optic which gives you either a red dot or a green dot as you prefer. The optic appears to be the TruGlo “RED•DOT 30MM DUAL COLOR SINGLE RETICLE” with a 5 MOA dot, that runs off of a CR2032 button battery. The choke tube is a Tru-Glo Head-Banger TG180X with a .665 inch exit diameter. With the choke tube removed, the barrel measures 21-1/2 inches from muzzle to breech. The Turkey Pro has a shorter buttstock as well: I measured it at 13 inches length of pull. The trigger, like all V3 triggers I've used, is excellent, breaking crisply at just over 4 pounds. It looks like the V3 Turkey Pro and the V3 compact use the same barrel and the same buttstock. They also use a slightly modified synthetic forearm. 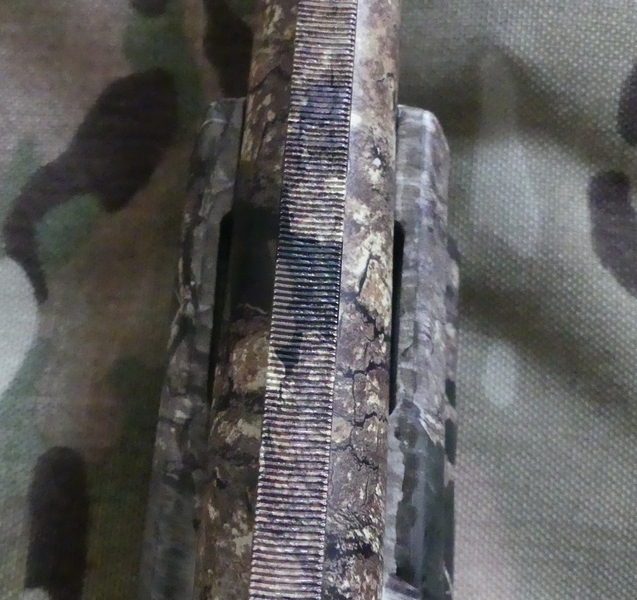 While the six little vents on top are the same as the original V3 synthetic models, there is a pair of additional vents near the barrel ring: similar to the V3 walnut's forearm, but not as pronounced. 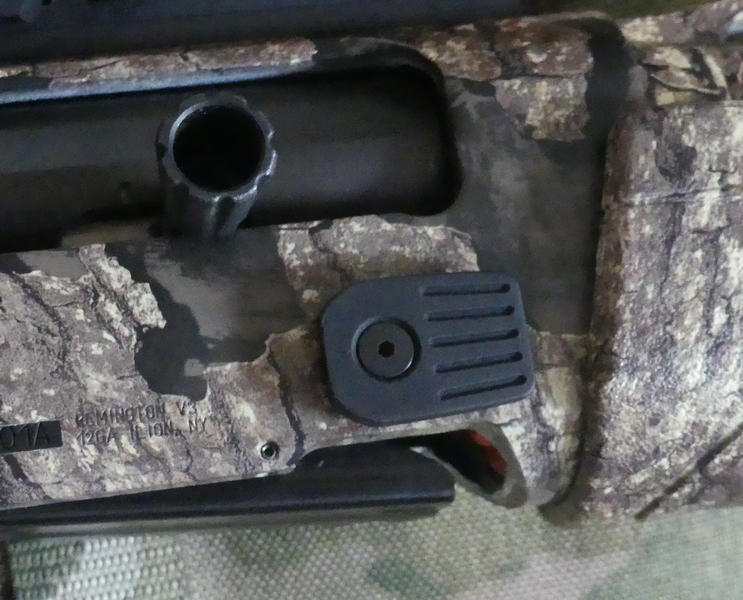 In terms of basic configuration the V3 Turkey Pro is set up with apparently the same, or very similar, TruGlo scope as the 870 SPS Turkey Predator model. I'll run through the list of refinements as far as the shotgun itself. Extended bolt release: any hunter will appreciate this, it works beautifully. Extended / enlarged charging handle: I think most people will like this, although I've never had any problems with the standard V3 charging handle. Beveled loading port: again, I think most people will appreciate it, but loading hasn't presented any problems for me with the standard V3 models. Beveled cross-bolt safety: actually, this is really a small matter, for the standard V3 cross-bolt safety is already large and very easy to get off. It is a subtle change and not all that significant as far as I'm concerned. Extra vents on the forearm. As for gripes, the only matter that I don't personally care for is the 13 inch length of pull buttstock. While I do understand shorter and easier-handling shotguns inside a cramped blind I personally much prefer a standard, 14 inch length of pull buttstock as standard equipment. The shorter buttstock makes more sense as an option, but not as standard issue. The primary reason to opt for the V3 Turkey Pro is the lack of recoil compared to any similiarly weighted shotgun. The next step is to see how it patterns,as supplied, with 1-3/4 oz. Longbeard XR #5 loads that I have at the ready. Note, 11/27/2018: According to Remington, production models of the V3 Turkey Pro ship with stock adjustment shims and also a length of pull adjustment kit.